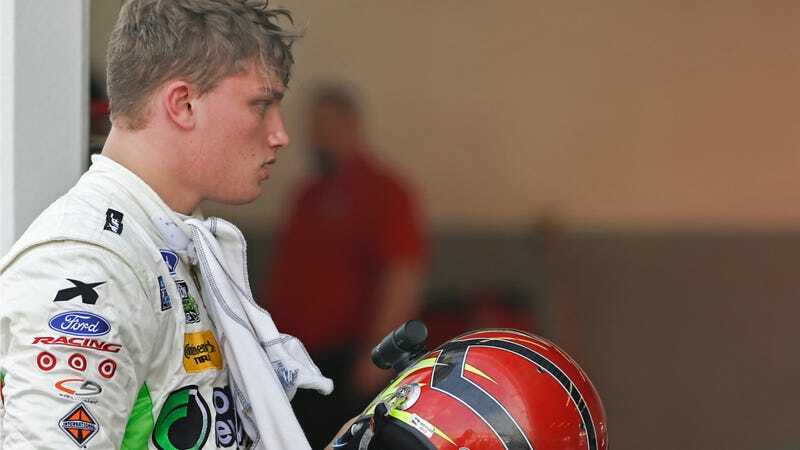 Rookie driver Sage Karam crashed in the first few hours of IndyCar's testing at Barber Motorsports Park today. According to USA Today, the crash was bad enough to injure his right wrist, and the team is unsure if he will be able to return to the test. This is immensely disappointing news, as Karam has been a standout in Indy Lights and other series. Last year, he got to drive in the Indianapolis 500, where he piloted a Dreyer & Reinbold Racing car to ninth place, finishing as the second highest rookie to contest the 500. Dreyer & Reinbold hadn't even ran since the last Indianapolis 500. Karam was driving the number 8 GE LED Chip Ganassi Racing Chevrolet when he went off. Per USA Today, he has been checked and released from the on-site medical center, but had not returned to the car after the accident. The tests going on this week at Barber are the first open practice sessions with IndyCar's new aero kits, where over 100 pieces can be added or left off to optimize aerodynamics for a given circuit. Here are the two kits side-by-side. It will be interesting to see how the different teams combine all the possible aero kit pieces from track to track this year. This week's test days will give the teams much needed experience with all the new aerodynamic bits. We hope Karam has a speedy recovery and is back in the car soon.